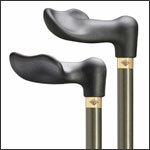 Ergonomic canes are specially designed for comfort, durability and style. The interesting look of an ergonomic walking cane handle is the ingenious design that fits your palm like a glove and evenly distributes your weight along the length of the shaft for added stability as well as comfort. 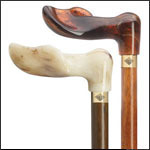 Every ergonomic cane displays unique style as well as superb craftsmanship that will last for years of heavy use. More doctors prefer the ergonomically designed canes than any other ordinary-handles walking canes, for helping with both carpel tunnel syndrome and the many different kinds of painful arthritis. Pay Special Attention! 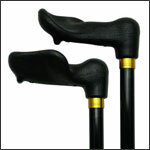 The palm grip-style and other ergonomically designed canes are specially crafted to fit either the right or left hand. Make sure you are aware of what you are ordering before making your purchase! Black Palm Walking Cane NON Adjustable 36"
White Marbleized Palm Grip Walking Cane - 42"
The palm grip handle is designed for comfort and exceptionally easy to grip. Palm Grip canes feature a molded handle design that evenly distributes body weight over the surface of the handle. These canes are also made to fit exclusively in your left or right hand. Palm grip canes are much more comfortable than standard cane handles. They work really well for people experiencing carpal tunnel syndrome or arthritis. 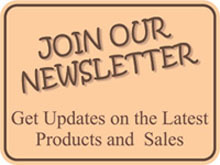 Many colors and styles to choose from, if you have any question feel free to contact customer service at 1-888-399-4870.